Love Cinnamon Rolls? Love Caramel Apples? Try combining them in one dish! Caramel Apple Cinnamon Roll Coffee Cake is perfect for your next brunch! And it’s easy to make! I love making coffee cakes for breakfast! I have a Bible Study group that comes to my house once a week, and this group of ladies knows that there will be something delicious in my kitchen each morning. What better way to start our study than with a big slice of coffee cake, a hot cup of coffee and some laughter with friends! Here’s the thing with this coffee cake. I based this recipe off of my love of this Cinnamon Cinnabon Coffee cake. Except of course I added in some delicious apples and topped it with a rich Caramel sauce. To make the recipe even easier, I used Crunch Pak apples! Have you tried these? My kids love sliced apples, so the convenience of having these on hand when we are running out the door is a blessing. I don’t buy much convenience food (since I make enough treats around here), but I don’t mind spending money on healthy convenience food! I bought a bag of the sliced apples, took a paring knife to remove the skin and diced them up. No need to cook them, just toss them in when the recipe calls for it. Did I mention this makes TWO coffee cakes? It freezes very well too. I have frozen this with the glaze and without. Just thaw on your counter or in the fridge. You can warm it up in your oven or microwave if you like to have a warm slice of cake. Totally YOUR call. Cause it’s YOUR cake. My good friend Jocelyn, from Inside BruCrew Life loves Crunch Pak apples too! 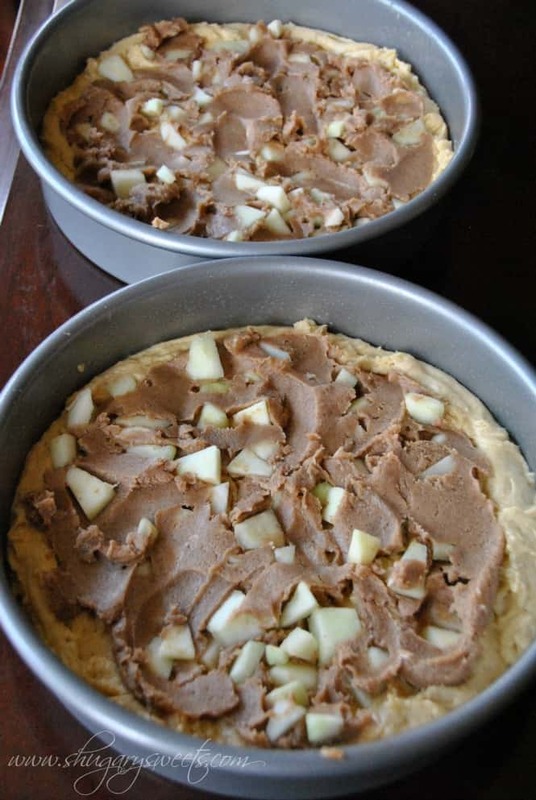 She is sharing a recipe for Apple Snickers Cake today! Stop over there and check it out (and tell her hello from me)! 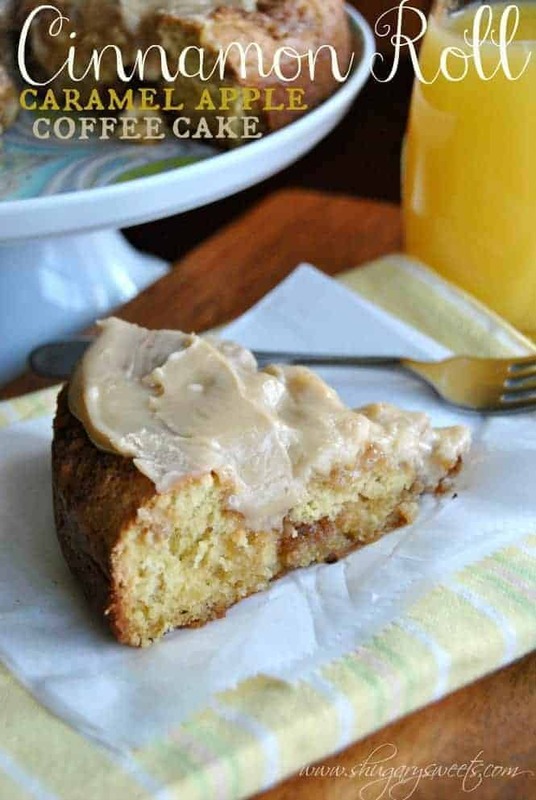 Here are some of my other favorite Coffee Cake Recipes…. 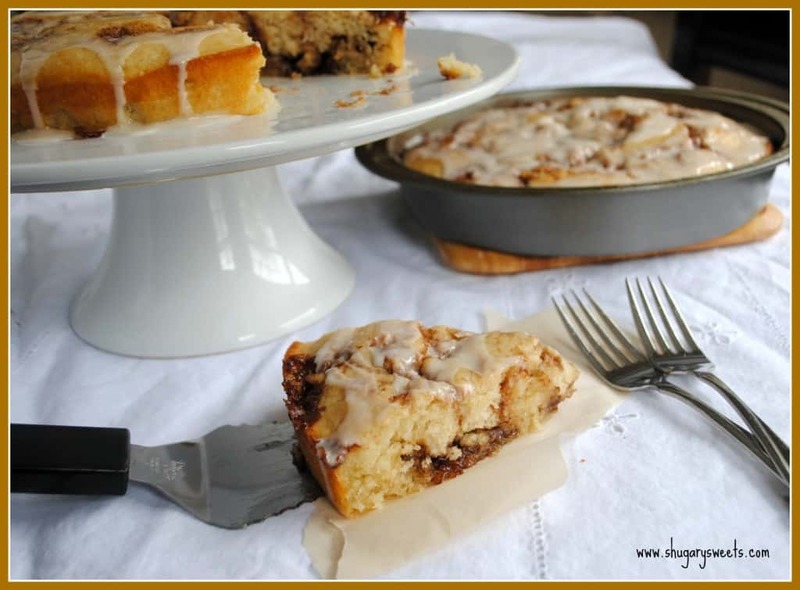 Cinnamon Cinnabon Coffee Cake: this baby gets made at least once a month in our home! We can’t get enough of how good it tastes! 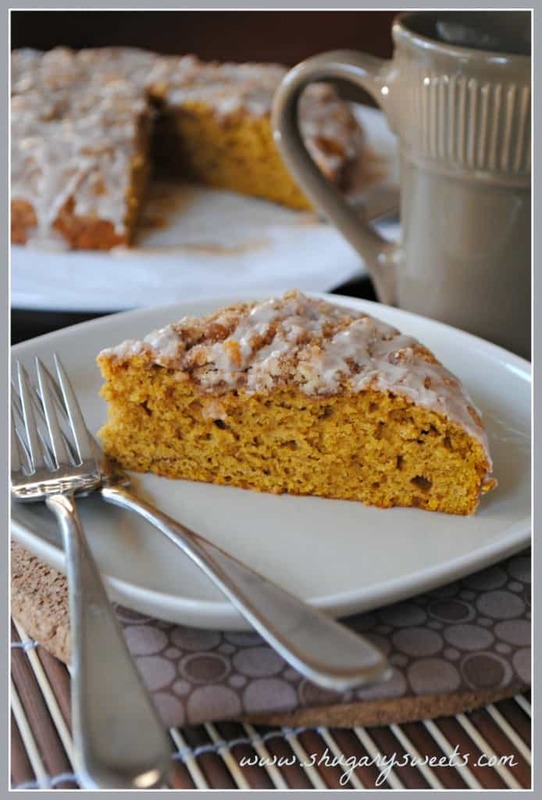 Pumpkin Coffee Cake with Cinnamon Streusel: it doesn’t have to be Fall to enjoy this pumpkin breakfast cake. You will want this all year long! 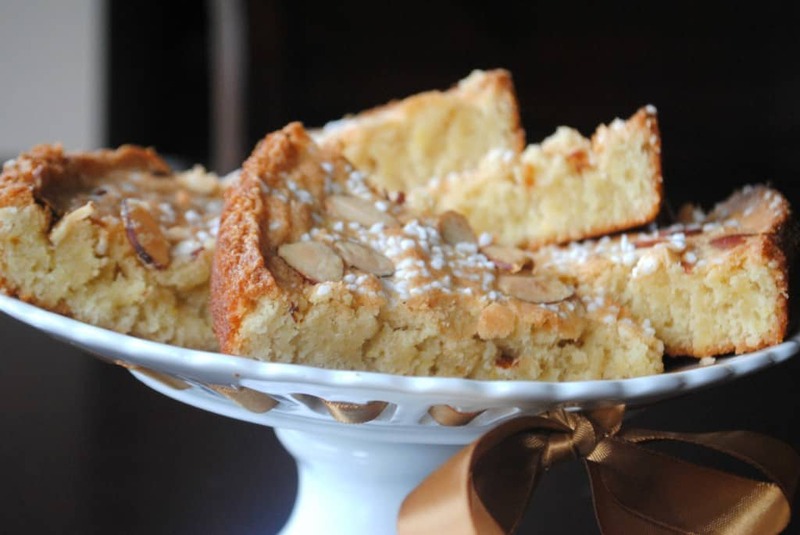 Swedish Almond Cake: this one will get you begging for more! It’s not overly sweet, but the almond and lemon together bring such flavor to the cake you will wish for a second slice. This recipe comes together in just minutes too! 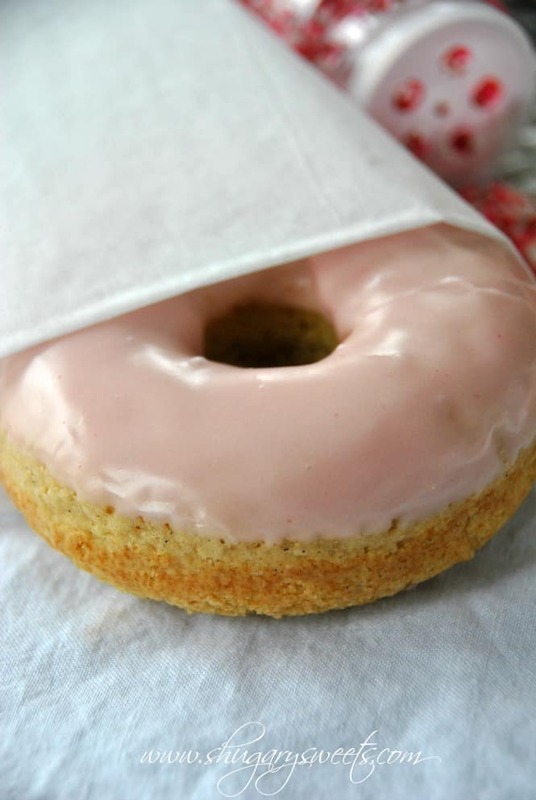 Strawberry Frosting Vanilla Bean Donuts: what’s coffee without a donut? 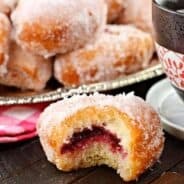 These baked donuts are moist and delicious and the glaze will remind you of Dunkin Donuts strawberry glazed Donuts! Love Cinnamon Rolls? Love Caramel Apples? Try combining them in one dish! Caramel Apple Cinnamon Roll Coffee Cake is perfect for your next brunch! And it's easy to make! Preheat oven to 350 degrees. Grease two 9inch round cake pans with baking spray and line bottom with parchment paper. In a mixer, blend flour, sugar, salt, baking powder, baking soda, milk, eggs, and vanilla until fully combined. Divide batter evenly between two cake pans. In same mixing bowl (no need to rinse it out), for filling, beat butter with brown sugar, cinnamon and allspice until fully combined. Fold in apples. Drop by cookie scoop onto batter, dividing evenly between two cake pans. Spread with a knife to smooth tops and swirl slightly. Bake cakes for about 30 minutes. Remove from oven and cool in pans 10 minutes. Remove from pans and cool on serving plate. For the glaze, melt butter in small saucepan over medium heat. Whisk in brown sugar and bring to a boil. Whisk for one minute, then add milk. Bring back up to a boil, remove from heat. Whisk in powdered sugar and pour glaze immediately over warm cakes. Enjoy warm or room temperature! **Crunch Pak Apples is a sponsor of Shugary Sweets and has provided free apples and other compensation. However, all opinions are 100% my own! I wouldn’t have it any other way! Thanks for linking up to my Blueberry Bread. I actually have a Cinnamon Roll Coffee Cake that I made in a springform pan not 2 cake pans, but with flavors similar to this one! I have an Apple bundt that I made when you hosted Apple week last fall, too! I love this whole flavor family. Beautiful, Aimee! Thanks Averie! I remember that Apple Bundt. YUM! I love having a “spare.” Plus my kids like it too, means they get some, and my bible study group gets some!! This cake looks divine and I love the way you can make two and freeze one! So great to not be too tempted to eat it all at once! This cake sounds so lovely! Awesome idea! Thank you for linking to my cinnamon rolls miss Aimee! This cake looks unbelievable. You never cease to amaze me. This is gorgeous! PS: let me know what you decide with a new server! That coffee cake is the bomb! I want to be in your Bible study group…I could use the studies and the cake!!! Wow – this sounds like one heck of a breakfast! And that glaze…..don’t judge if I just grab a spoon! I am not here to judge 🙂 i may have done the same myself! What a lovely coffee cake! I love that apple filling! To get all the flavors I love in one simple cake sounds perfect! This must make the house smell like heaven (kind of appropriate for bible study 🙂 ). Super delish Aimee! One of my favorite variations of my mom’s coffee cake is apple. This is gorgeous! One of the saddest days in high school was the day our mall lost its Cinnabon. Even though that was over 10 years ago, I still get nostalgic when I smell cinnamon rolls. 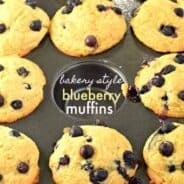 I am so thankful you posted this recipe. It looks impossibly delicious! Oh that would be sad!!! I love a good coffee cake and this looks fantastic! Is there any butter in the cake batter? Nope! There is enough in the filling on top that it seeps through the entire cake! This sounds so good! Think I am gonna make this for my next women’s gathering. Those lucky ladies in your Bible study group! Sounds like a nice time to try new coffee cake recipes for sure. I love coffee cake. I still need to get donut pans and make your strawberry donuts! I love how you are making cinnamon rolls into a coffee cake. Apple cake was probably one of the most frequent desserts my mom baked when I was growing up. So I absolutely love anything baked with apple. I love making cinnamon rolls. But sometimes I just don’t have the time, so these cakes are the perfect fix! Cinnamon roll AND coffee cake???? I diiiieeeeee. Oh my goodness, Aimee. Can I PLEASE come live with you? Your kids are like, the luckiest kids alive for getting to eat this for breakfast. LOVE IT. Sure, what’s one more in the house!!! I’m old enough to be your mother, how scary is that???? That looks wonderful! All of my favorite flavors! Watch out, I’m heading over to your house for a slice of this coffee cake! This is so beautiful Aimee! 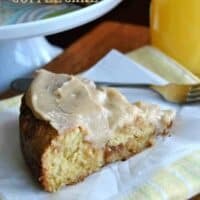 I love anything involving cinnamon rolls, so I can imagine how much I would love it worked into a coffee cake! The addition of tart apples makes it even better! Thanks Audra, it definitely is a delicious coffee cake!!! This looks amazing! And I love that it makes two. One for now and one for later is perfect! 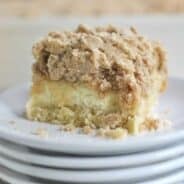 I am always on the lookout for a great bring-to-bible study coffee cake that is easy and delicious. Will be trying this out when it is my turn next! Okay, I know what I want for breakfast tomorrow! Pinning this for a surprise for my husband, he loves coffee cake! Great flavors! This looks and sounds AMAZING!! I can’t wait to make it. Perfect recipe for Easter morning! We will be having it over Easter weekend as well, it is perfect for company! Oh, I love this combination!!! Hi! I’ve been following your weblog for a long time now and finally got the courage to go ahead and give you a shout out from Porter Texas! Just wanted to mention keep up the great job! Hi! I’m looking for your caramel apple truffle recipe, but all the links I’ve found just keep directing me here! I found a pin (http://pinterest.com/pin/197806608604534326/) for them, and they look fabulous, so I’d love the recipe! Unfortunately I took that recipe off my website temporarily. Several people had issues with it not setting up properly. I am working on remaking it and reposting it. Sorry for the inconvenience!!! I’m just glad you took it down and I’m not crazy for not being able to find it! I’ll keep an eye out for the updated version. Thanks for the quick reply! Also, I just recently saw you on CincyBlogs…I’m a Cincinnati blogger, too! Would it make a difference if I used 2% milk?